Ever since I shared my tips and tricks for shopping gluten free at Aldi, I knew I wanted to create a similar guide for other grocery stores I enjoy shopping at. So when I happened to be near the Trader Joe’s across town from my parent’s house this summer, I knew I had to share some of my favorite finds and shopping tricks. Although I don’t shop at Trader Joe’s as often as some other stores (cough cough, Aldi and Sprouts Farmers Market), I do think it’s an awesome store for buying cheap healthy staple items as well as gluten free specialized goods. 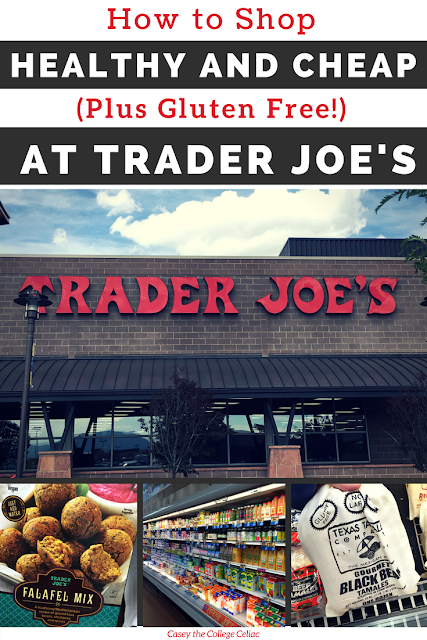 So whether you’re a Trader Joe’s addict or just looking for ways to eat healthy for cheap, here are my five top tips for eating heathy, cheap and gluten free at Trader Joe’s! 1. Think of Trader Joe’s like a baby between Aldi and Whole Foods. Until the Gluten Free Teen Summit and a pool-side conversation with Celiac and the Beast, I had no idea that Aldi and Trader Joe’s were actually founded by two brothers. Although both companies are run independently, the similarities between the two grocery stores - both of which offer healthy food options at a more affordable price - suddenly made a lot more sense! However, at least in my experience, Trader Joe’s definitely has a lot more options than typically offered by Aldi. For instance, Trader Joe’s has a huge dairy selection, including a lot of different vegan items that are much cheaper than most plant based milks or yogurts. Trader Joe’s also seems more consistent in what they offer (with new products popping up here and there, as well as seasonally) while many of Aldi’s more specialized products (including certain gluten free items) are sold for only a limited time. So if you’re about to walk into Trader Joe’s for the first time, don’t expect endless rows of (pricey) options like at Whole Foods...but expect some more choices than typically found at Aldi. 2. Load up on Trader Joe’s affordable produce - and watch out for awesome sales. At least based on the trip I made earlier this month, many of Trader Joe’s product prices were comparable to Aldi’s. I could get a pack of 3 large zucchini for $1.99, various bagged lettuce mixes for the same price and bananas for 14 cents each. If you’re trying to eat healthy on a budget, it’s definitely important to read the prices carefully because Trader Joe’s sells produce by different units versus just by pound, container, etc. Like Aldi, though, you can score some amazing deals depending on the week and month. At least to my knowledge, Trader Joe’s doesn’t have weekly deals like Aldi or Sprouts, but they do release a “Fearless Flyer” each month that highlights a few products. Personally, I’ve found that the more grocery shopping I do, the more I remember what foods are cheaper in each store. Once you can keep a mental tally, you’ll know what sales are really worth buying. 3. Take advantage of their various frozen items. I also love Trader Joe’s for all of its freezer items! They sell a bunch of frozen meats and seafood, and while the prices seemed higher than I often see at Sprouts Farmers Market, I appreciated the variety of fish and cuts available. I’m always even more excited about Trader Joe’s other frozen items, though, which range from fruits and veggies to gluten free black bean tamales to veggie (and meat/fish based) burgers. I know other gluten free bloggers have also shared finds like gluten free fish sticks, and staples like frozen cauliflower rice make it easy for anyone to cook a healthy meal with little time or energy. As I’ve shared many times before, I’m alllll about using frozen foods (especially fruits and vegetables) to eat healthy and gluten free on a limited budget. While Trader Joe’s frozen vegetables can be more expensive than those found at stores like Walmart, the variety of Trader Joe’s frozen items definitely makes it worth a visit! 4. Save money on gluten free food by buying Trader Joe’s off-brand goodies. The big reason Trader Joe’s keeps me coming back, though, is how many amazing gluten free items they have! Similar to Aldi, Trader Joe’s carries a lot of off-brand products that taste very similar to products from big names like Enjoy Life Foods, Tinkyada pasta and Food for Life. So you can find treats like gluten free Oreos, chocolate chip cookies and snickerdoodles, waffles, rice tortillas, gluten free pastas, cereals and more for much lower prices than you typically find. Beyond the treats similar to other gluten free products on the market, Trader Joe’s also offers some amazing gluten free products of their own. I keep hearing more and more great things about their gluten free and vegan falafel mix, as well as their cauliflower pizza crust. I can also attest that their plantain chips and their corn (no oats!) based granolas are crazyyyyy addictive. 5. Experiment with new products and finds...to a point. 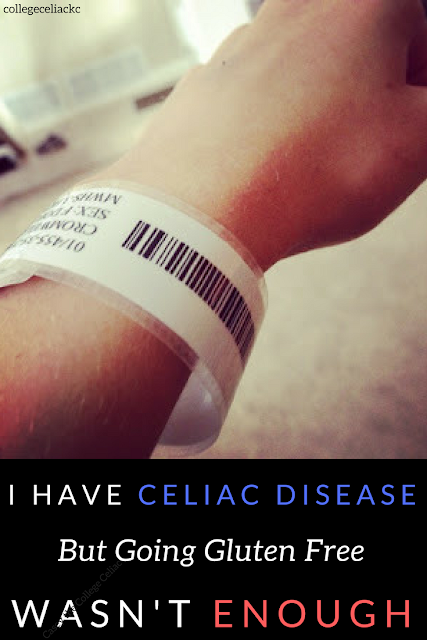 I’m no nutritionist, doctor or diet expert (just a college student with celiac right here! ), but I think the key to enjoying a healthy diet is spicing things up with new foods and products. Trader Joe’s has definitely helped me with that! For instance, I love Trader Joe’s coconut aminos (basically a soy-free version of soy sauce), and it’s a tooooon cheaper there than anyway else I’ve found it. Fat-free refried beans were a new find of mine (they’re vegan but not labeled gluten free, so I decided against buying them), and Trader Joe’s also offers a variety of pre-made salads, dressings and sides that can help round out a healthy dinner. Erica from Celiac and the Beast posted about Trader Joe’s vegan and GF pesto a few weeks ago and I definitely want to try that the next chance I get! Obviously, if you grocery shop on a budget like I do, yelling "YOLO!" and buying every new gluten free product that catches your eye will not help your bottom line. My usual tactic is giving myself a limit on the amount or cost of my "special" items each week. 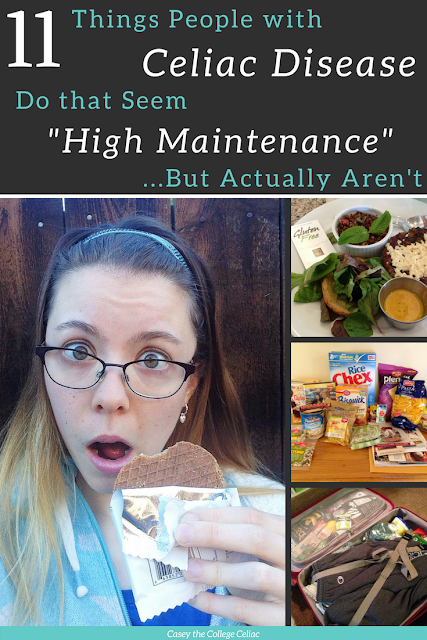 This lets me try out new gluten free products without totally busting my budget. Is Trader Joe's my favorite grocery store for shopping on a budget and eating gluten free? No. But is Trader Joe's definitely worth visiting if you're trying to save money, eat healthier or find unique (and affordable!) gluten free items? For sure! The best thing about experimenting with different grocery stores is being able to find out which store serves your needs best and which items are the cheapest at each store. For instance, I might get my produce at Sprouts one week when there are tons of sales but stop by Aldi or Trader Joe's for gluten free foods like pasta and chips. Whatever your grocery store soul mate ends up being, I hope these tips give you a good idea of what Trader Joe's is like and why you might want to swing by during your next grocery day. And if you get addicted to their gluten free pita chips or cauliflower pizza crust? Well, just don't say I didn't warn you! Do you shop at Trader Joe's? If so, do you have any favorite products? I'd love to hear in the comments! Shopping at Trader Joe's can be affordable if you're very careful. They do offer good prices on some things, but if you don't keep a grip on your purse you can blow the budget by adding treats to your cart. Peanut butter is one thing they sell at a good price, and they have "soyrizo" GF/vegan sausage, which I buy two or three of when I go (then freezing some for later), as I don't see it at the other places I shop. I'm definitely a fan of the cauliflower rice! Very true! All about being aware of prices! TJ’s frozen riced cauliflower is. the. best. something about its texture, compared to the bag of cauli rice found next to the lettuce and spinach. and if you have never tried their cauliflower gnocchi, run...don’t walk and get bags of it! I have yet to try but I still want to try the gnocchi! I love Trader Joe's but unfortunately, it's over an hour away so I don't go very often. We have a local Aldi's where I do most of our weekly shopping. I love the produce department at Trader Joe's and the roasted almond butter is my absolute favorite! Aldi's is definitely another winner! I LOVE Trader Joes but I've been deprived of shopping there since we moved from VA to TN 2.5 years ago. I'm so excited because there is one opening next month in our city - you better believe I'll be shopping there all the time! PS - thanks for the heads up about coconut aminos being cheaper there - I get mine at Sprouts but will check out TJs for sure when it opens! I hope you've checked out the store and found some winners! If you wanna shop on the cheap - TJ's is where it's at! As is SPROUTS! Have you ever been to a SPROUTS?! I have and I LOVE Sprouts as well! Thanks, Casey! I loved your mention of vegan falafels (I love those! and oddly enough they remind me of a friendship with a coworker in Boston who introduced me to them)... I also loved the idea of gf fish sticks and cauli pizza crust, and you reminded me to try coconut aminos (I'm a soy sauce addict). One thing I always buy at TJ's is scallops. They're pricey, but I love that they tell you where they came from, and they're the food that is highest in taurine (a key amino for liver and I have a sensitive liver). I also share a scallop with my kittty because taurine is essential for kitties. I haven't been to TJ's in a while and I should go back because I need to find a reasonable sub for cheese now that I'm casein free. Your description of the dairy section is wonderful! My only feeling of 'meh' about TJ's is the lack of organic or even 'verified non GMO' labels. That's some thing I've tried to stick to throughout my life and it's getting harder. I'd flip head over heels if I saw certified biodynamic, but that's mainly in Europe. If I had any energy I'd be starting an organic farm. The more the merrier! Thank you for these tips and I'm going to go read your other market reviews, so helpful! Hi again, the "sprouts farmers market" link at the beginning of the article didn't go where I expected it to go. Did you write a review of Sprouts? The first one in my area opened about a year ago and I like it a lot. Hi Angelica! I haven't done a full review of Sprouts yet (I'm no longer living where one is located near me), but I plan to in the future. The post that is linked in this post features a paragraph review of Sprouts Farmers Market, hence why I used that link. I really love Sprouts, though!